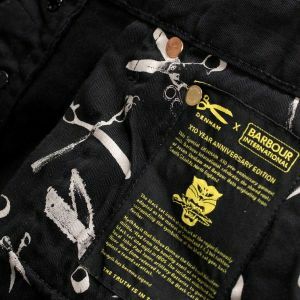 Globally renowned brands Denham The Jeanmaker and Barbour International have recently launched Denham X Barbour International, a new limited edition capsule collection for fall/winter 2018-19 as part of Denham’s 10th anniversary special series of celebration initiatives. Jason Denham, founder and chief creative officer of Denham The Jeanmaker, explained the project and why he considers collabs strategic nowadays. Why did you choose to start this collab with Barbour? I’ve always been a big fan of Barbour and this was a perfect fit for the winter edition of our 10-year anniversary series of collaborations. I was born close to the Barbour factory in the North of England. I own a great Barbour oil cloth jacket that has been in my archive for 25 years; this was the trigger to connect with Barbour. What ties are there between a traditional UK brand as Barbour and your jeans brand? We both consider quality of materials, design functionality and after care service as being a strong part of our brand DNA. Barbour treats its jackets in the same way that we treat our jeans, beautifully made with high quality performance fabric and long service life. Was it complex creating this collection? We have been working on the project for one year. We wanted to pull the best from both brands and we invested a lot of time in product development and 360° storytelling. Will it be a one-shot project or will you continue it for more seasons? Ten pieces for the 10-year anniversary. The two signature fabrics are 4oz oil cloth from Barbour and Italian 12oz denim from Denham. The total collection counts three jackets – The classic Barbour A7 Biker in oil cloth and the Denham western jeans jacket in both oil cloth and denim. It also includes graphic embroidered sweats, printed tees and jeans that carry the crossover signature branding and embellishment. Are you also including jeans with some kind of “waxed hand”? We experimented with that but the results didn't match expectation, it was also the obvious thing to do so we focused on the rest of the collection. Are you considering launching other collabs or capsules with other brands? Yes, absolutely. This year we are activating 10 stories for our 10th anniversary and next year we will continue to collaborate on exciting projects. What new fields and markets could this collab connect your brand with? This is a win–win project for both brands–we have cross sourced high quality products and distributed them in great distribution as well as through the international Denham retail store network, with full 360° marketing support, photography, animation, window display and storyelling all aligned. Many brands continue launching special collaborations. Do consumers continue to appreciate them? We have had an incredible reception to this one, so I guess the answer is yes. It’s very important that the collaboration has depth and a good story to tell and we are very proud of this one. Could such collaborations eventually cause some sort of “diluting” of their image and identity? Yes and no. There are two approaches to collabs. Normally they are one-hit wonders and they give both brands the freedom to break their own rules–meaning no risk. However I do believe that it’s important to respect each other’s brand values and integrity. How can a company or brand avoid such a risk? Get it right–full 360° approach.